MCN finally gets to test the new Aprilia RSV4 tomorrow at its world launch. The 999c V4 superbike is one of the most eagerly awaited machines in years, and we’ll be riding it on Thursday 2 April at Misano in Italy. We’ll bring our first impressions of the RSV4 straight to you on www.motorcyclenews.com on the day, as well as a full round-up of whether the gorgeous Aprilia goes as well as it looks, in MCN on Wednesday 8 April. “I’ve had some good jobs working for MCN, but this has got to be one of the best: to ride the new RSV4, I can’t wait! "The only V4 litre sports road bike I’ve ever ridden before is the Ducati Desmosedici RR, and we all know how good that is, so it looks like there’s going to be a treat in store next Thursday. “The old V-twin RSV superbike was a track tool par excellence and actually won the Masterbike shoot-out a few years ago, against the best road going sportsbikes in the world at Jerez." The RSV4 looks like it will carry on in the same tradition, but with its extra two cylinders will have lots of extra revs and power to play with, which should make it a blast around the track. “This is the bike that could put even the new R1 in the shade. Biaggi seems to be going well on it so far, scoring two podiums in the first four WSB races. “Luckily I’ve done lots of laps on the new clockwise layout of Misano over the past few years, so I’ll know where I’m going from the off. "This will let me get into the groove straight away on this amazing new Aprilia and I’ll let you know just what it’s like here on www.motorcyclenews.com as soon as I’ve ridden it. “If there’s anything you want to know about the RSV4 after I’ve ridden it, or want me to ask the Aprilia project team, contact me on michael.neeves@motorcyclenews.com”. “It all started for me in September 2006 – there were already some proposals, some sketches and the engine was already mapped out in terms of what we knew it was going to be like. We made a clay model in just five weeks. Francesco Polimeni, Aprilia Marketing chief. “The RSV4 is vital to Aprilia – we cannot exist without the RSV which needs to be on the track and winning races. We took the V4 option because it’s the best for winning races in the World Superbike series. "It’s the best way of making a success of racing. We have no fixed numbers of bikes we have to sell but there will be around 1000 produced in the first year”. “I’m five foot nine inches tall and my immediate reaction was how tall the bike felt. It wasn’t uncomfortable, but it was a stretch to get my feet to touch the ground. Later the Aprilia guys told me the seat unit was being lowered by 10mm – that should make a difference. "Other than that, the rest of the bike was incredibly compact yet amazingly roomy. 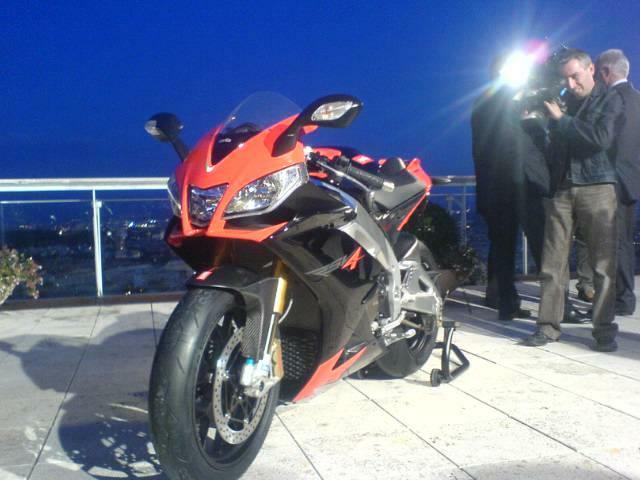 The current FireBlade is the nearest comparison”. Andy Downes, Chief Reporter, MCN, after visiting the Aprilia factory in Noale, Italy in November 2008. Poll: How excited are you about the new Aprilia RSV4? In next week’s issue of MCN we’re bringing you pictures of the brand new full LeoVince 1098R system.